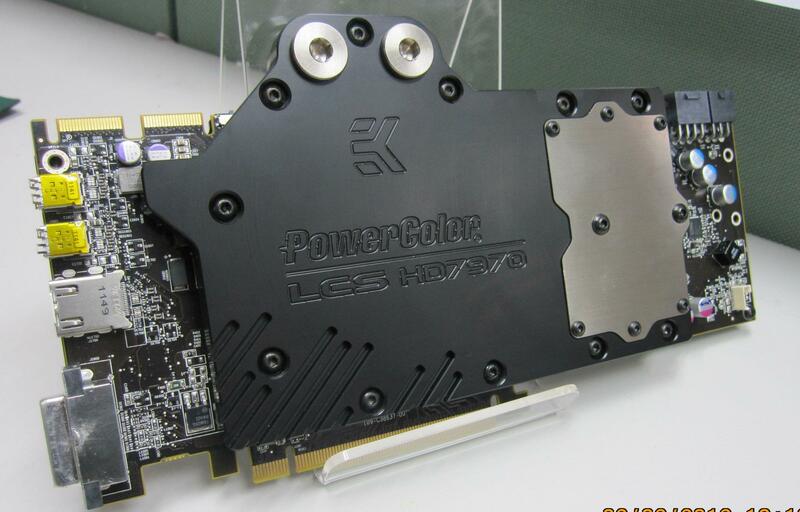 PowerColor is readying a Custom designed Radeon HD7970 LCS Graphics card featuring a single slot waterblock from EK Waterblocks. The PowerColor HD7970 LCS (Liquid Cooling System) comes with the new EK waterblock which covers the GPU Core, Memory chips, VRM and power area to ensure proper cooling. Other specs on the card include 2048 Stream Processors, a 384-bit memory interface, 3 GB of GDDR5 VRAM, DVI, HDMI and dual mini DisplayPort outputs. Due to a single slot design, it would be easier to couple up four of these baddies easily in your PC. Frequencies are unknown but the card would probably pack some nice Factory OC’ed specs, Release date is yet to be announced.